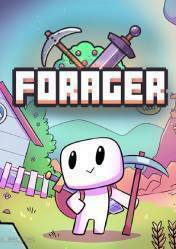 This product is a digital version of Forager and is available directly from the Steam store, or through digital keys in other online stores. It is also possible that a store sells it in format "Steam Gift" so you will have to activate it by clicking on the link that we will receive in our email after buying it in this version. If we receive a key instead of a Steam Gift, we must enter the key in the Steam gaming platform (section "Add games" of our "Gaming library") to start the download. It's an open world 2D game with an emphasis on exploration, agriculture and creation, inspired by other titles in the genre such as Stardew Valley and Terraria, among others. Collect, collect and manage resources are the basis of this new title that will arrive on April 18 in Steam and other platforms. Craftsmanship and the creation of articles and structures will also be a key part of the game. Build and grow a base from scratch, buy land to expand and explore, level up our character and his skills (gathering and combat) and most importantly, find all kinds of plans and construction schemes to expand our chances of survival. The game offers total freedom to explore and build, with a deep system of skills, equipment, and the ability to create clans or networks of friends with whom to share adventures, dive into dungeons to get their treasures and jointly build a powerful base of operations. There are no comments yet about Forager. You can be the first one!